In these difficult economic times, hunger has become more rampant for many in our communities, and for those who have known it regularly as normal life, even their experiences are gaining heightened media exposure as hunger begins to more deeply affect those in the mainstream. Making strides on this issue, which affects billions across the globe daily, is an ageless challenge. Fortunately, there are initiatives and opportunities devoted to this effort, including the work of the Congressional Hunger Center (CHC) and their Mickey Leland International Hunger Fellowship and the Bill Emerson National Hunger Fellows Program. The CHC is seeking applicants for both programs now, though you can find more details on the Emerson Fellows program below. The CHC seeks Emerson Fellow applications by January 18, 2011, from those who reflect the Center's values of leadership, diversity, and commitment to social justice. The Congressional Hunger Center (CHC) is excited to offer a unique opportunity to be actively involved in the movement to end hunger and poverty. CHC is a bi-partisan organization committed to making access to nutritious, affordable and culturally appropriate food a national priority. Every year, we look for promising young leaders who care about addressing the problems of hunger and poverty in communities across the nation. Our national initiative, the Bill Emerson National Hunger Fellows Program, trains, inspires and sustains a tight-knit community of emerging leaders committed to social justice. The program provides Fellows with an opportunity to gain practical experience fighting hunger and poverty, work with community-based and national leaders, deepen their analysis around poverty and develop leadership skills. 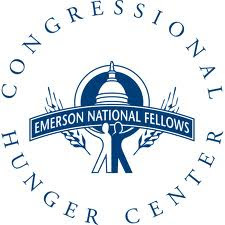 Each year, twenty Emerson National Hunger Fellows help shape and implement local social justice programs all over the U.S. and then research and support national policy initiatives in Washington, DC. Participants are selected for this eleven-month program based on the criteria below. Fellows are placed for five months with urban and rural community organizations involved in fighting hunger at the local level, such as grassroots organizing groups, food banks, local advocacy groups, economic development agencies, and faith-based organizations. They then move to Washington, D.C. to complete the year with five months of work at advocacy and public policy organizations involved in anti-hunger and anti-poverty work at the national level. This unique program allows Fellows to bridge community grassroots efforts and national public policy. Applications are encouraged from candidates reflecting diverse educational, cultural, personal and experiential backgrounds. A living allowance of $14,500, health insurance, housing in the field, a housing stipend in D.C., travel expenses,professional development training opportunities, and a $3,500 end of service award are included. The application deadline for the 2011 – 2012 program is January 18, 2011. Semifinalist selection will be complete by mid-February; interviews will be scheduled in Washington, D.C. in March; and final selection decisions will be made in April. Hunger Fellows arrive in D.C. for Orientation and Field Training in late August 2011. For more information about the Program and for details on the application process, please visit our website: http://www.emersonapplication.org. If you have questions, please email fellows@hungercenter.org or call (202) 547-7022 ext. 29.